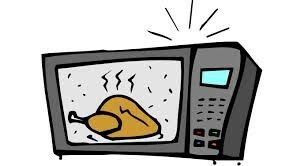 Microwaves act as high frequency electric fields and will generally heat any material containing mobile electric changes, such as polar molecules in a solvent or conducting ions in a solid. Microwave heating is able to heat the target compounds without heating the entire furnace or oil bath, which saves time and energy. The picture above just shows the different magnetic waves coming together or the energy.